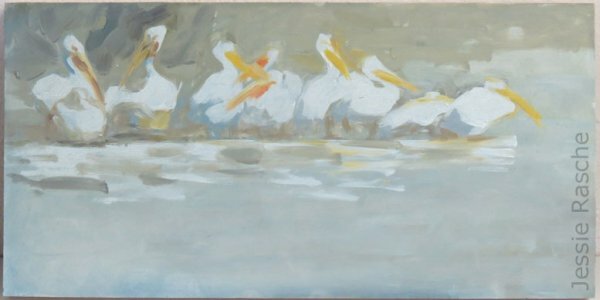 A subdued painting of a gaggle of happy pelicans, 6×12 inches. Jessie Rasche is an award-winning South Dakota artist. Her landscape, floral and portrait paintings hang in private collections in every region of the US and Canada, and in Ireland, and have shown in galleries in South Dakota, Washington, California, Minnesota, and Kansas. You can see a rotating display of her work at the Art Resources Gallery in Minneapolis, South Dakota Art Museum gift shop and at the Southwind Gallery in Topeka KS. Jessie’s paintings have been published in the South Dakota Magazine, the Brookings Register, the Spokesman-Review and other publications.